Yahoo! 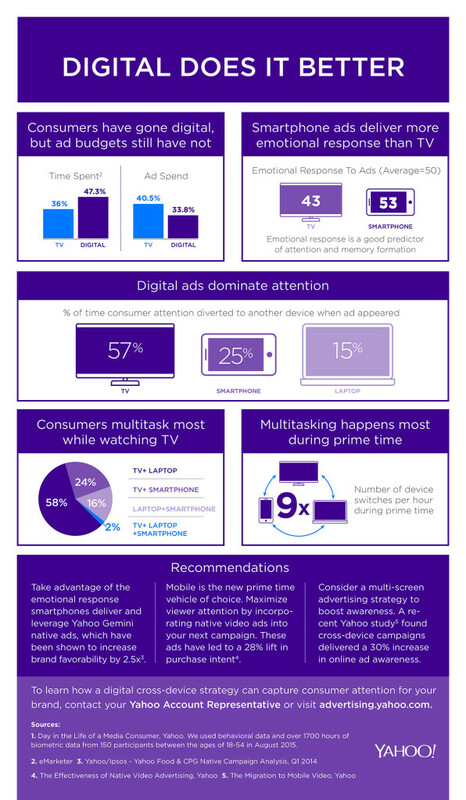 recently released this informative infographic about consumer habits about content consumption and digital habits, and shows that many of us are more responsive to ads from our tablets and smartphones than traditional television, and we’re also less likely to be distracted by another device. More than ever before, we multitask with 2 or 3 devices with us in front of the TV, and switching often while doing so; skewing our attention between multiple channels. Unfortunately, not enough brand budgets are reflective of this shift, as they still rely heavily on television as their marketing and advertising focus. It’s important to take advantage of these new digital spaces, and take advantage of formats like video in 2016. As mobile continues to become a main content viewing device for many, these video ads will be an important part of connecting with future customers. A great option to consider is taking advantage of multiple outlet types, both digital and more traditional methods like television. Having your brand on multiple platforms helps consumers better recognize and connect to it, giving it an overall boost in awareness. As important as online efforts and digital advertising has become, managing them has become even more important. Sign up for a free SEMPAD beta account today to experience ad management simplified.